Dogs and Baths, Oh My! Some dogs naturally take to water and like any opportunity to frolic and play. Others, not so much. Here are a few tips to help make bath time more enjoyable. Taking a long walk is good for both you and your dog and also reduces their energy level. Some dogs even enjoy going for a “swim” after exercise. For the first few baths, do one small step at a time, giving your puppy a chance to get used to each new experience. Start with an empty bathtub (with a mat) and a little playtime in the tub. 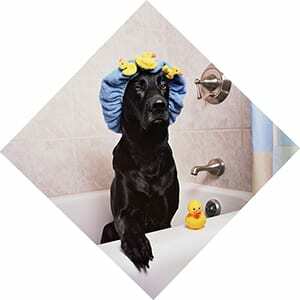 Then, when the dog is outside the tub, run the water to help him or her get used to the sound. Next time, add a small amount of water to the tub and maybe just dip the paws in. It’s important not to rush the process. Keep working your way up to a full bath – watching for that state of calm at each new step before you move on. Bathtubs are slippery, so be sure to use a non-slip mat or large towel that will stay in place. Did you know they make special pet shower spray attachments? Lowering the pressure and water flow and holding it close to the fur can be less surprising. Use a wash cloth around the face and be careful that water doesn’t go up the nose or in the ears. Be aware of your body language and tone of voice. Make it fun! Incorporate toys and make time for play. Make it tasty! 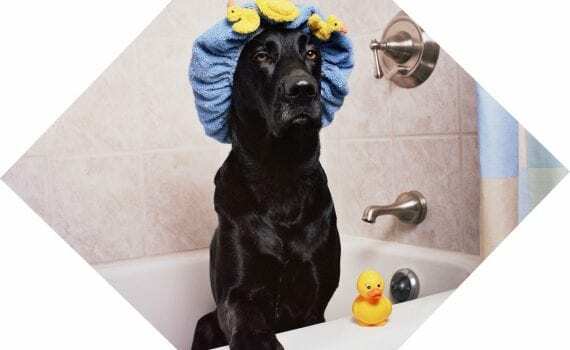 Bring some treats into the bath area – or feed your dog there a few times to get him to associate good things with tub time on days when you aren’t planning a bath. It’s never too late to employ a little planning and consistent effort to make bath time less of a struggle. And, you can always hire a trainer if you need some extra help!